The Rev. Fr. Robert Miclean is Rector of our Mission and pastor to our congregation. Fr. Robert was born on the Feast of the Holy Cross, September 14, 1969 in Redwood City, CA. He completed his M.Div. from Nashotah House Theological Seminary in Wisconsin in 2002 and the St. Stephen’s Orthodox Theological Studies Course through the Antiochian and Ukranian Archdioceses in 2005. Fr. 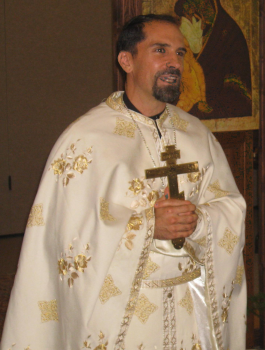 Robert was ordained to the diaconate in 2009 and to the priesthood in 2010 by His Beatitude, Metropolitan JONAH, at St. Nicholas Orthodox Cathedral (OCA) in Washington, D.C. Since 2004 he has served as full-time OCF chaplain at St. John’s College and the U.S. Naval Academy. He now shares his chaplaincy duties with his pastoring of the Mission community. Fr. Robert is an evangelist at heart, desiring to help all those “storm-tossed” on the waves of our culture to find safe harbor in the ship of the Church that leads us to further up and further in God’s eternal Kingdom. He also sees our church as a home for all of us in need of Christ God’s healing and growth in the life that is in Christ alone. Thus, at Holy Archangels, we desire to be a home for those already Orthodox but also those seeking the fullness of the life in Christ in His Church. In addition to his M.Div., Fr. Robert also has an M.A. from Georgetown University and the Walsh Graduate School of Foreign Service. He served as an English teacher in Romania, the land of his forefathers, for two years following college and speaks both Romanian and German. From 2002 until his ordination to the deaconate in 2009, he also served as lay pastoral assistant for College and Youth Ministries under the leadership of the Very Rev. Fr. Gregory Matthewes-Green, pastor of Holy Cross Orthodox Church. Fr. Robert has been very happily married to Preoteasa/Matushka Krissy Miclean since May 2009. He delights in their three children, Anastasia (Ana) Marie, born Pascha, 2011 and James (Iacob) Robert, born August 2012, and Simeon Mihai (Mihai) born March 2014. He and his family live in Annapolis, Maryland.